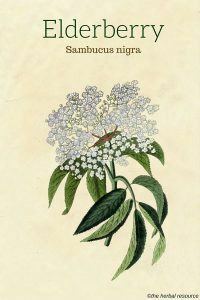 Botanical Name: Sambucus nigra, Sambucus canadensis. Other Common Names: Black elder, black-berried European elder, European elder, boor tree, bountry, elder, ellanwood, ellhorn, German elder, saúco (Spanish), sureau noir (French), almindelig Hyld (Dansish), Schwarzer Holunder (German), svarthyll (Norwegian). Habitat: Elderberry is native to most of Europa, parts of Asia and North Africa. Black (American) Elderberry (Sambucus canadensis) is widespread in eastern North America, ranging from Nova Scotia to Florida and west to Manitoba and Texas. Plant Description: Elderberry is a shrub or small tree, between 3-10 Meters (10 – 30 feet) high. The bark is light brown at the bottom of the trunk and becoming gray-white higher up. The leaves are opposite, odd-pinnate, the leaflets ovate, acuminate, finely serrated, and dark green. White to yellow-white flowers which develop into the fruit, berries that turn from green through red-brown to shiny black. Plant Parts Used: Historically, the entire plant (leaves, bark, flowers, and berries) has been used medicinally. In today’s herbal medicine, it is primarily flowers and juice from the berries that are used. The flowers contain essential oil, flavonoids (kaempferol, quercetin), quercetin glycosides (rutin, hyperoside, isoquercitrin), triterpenes, sterols, chlorogenic acid, caffeic acid, tannins, pectin, sugars, and mucus. The fruits contain the glycosides, rutin, isoquercitrin and hyperosid. They also contain the anthocyanin glycosides sambucyanin and chrysanthemin, tannins, traces of essential oil, fruit acids (citric, malic and tartaric acid), sugars, carotenoid and vitamin C.
The leaves contain triterpenes (similar to those found in the flowers), cyanogenic glycosides including sambunigrin, flavonoids (kaempferol, quercetin), quercetin glycosides (rutin, hyperoside, isoquercitrin), fatty acids, alkanes, and tannins. There is an abundance of remedies associated with elder and few other plants have been so highly valued for its medicinal properties. Elderberry was used by Native Americans to treat an infection. 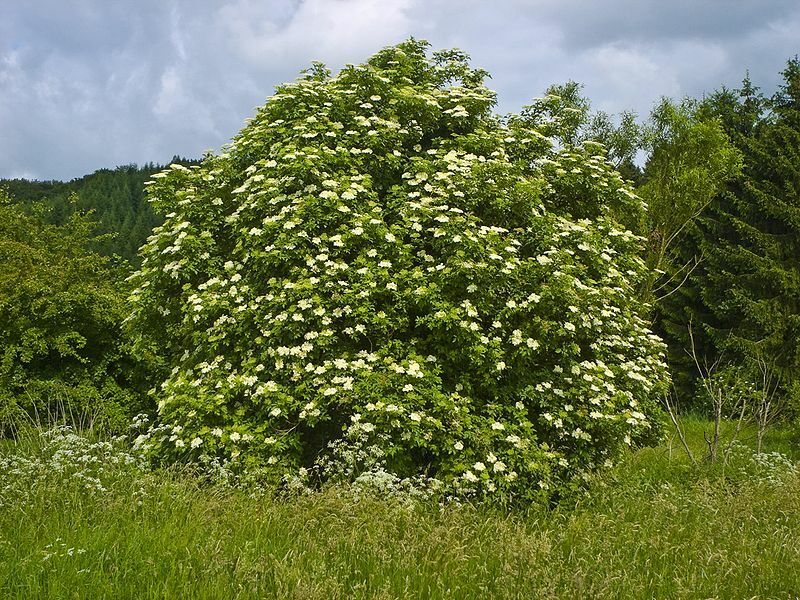 The elderberry flowers have expectorant and anti-inflammatory properties and are often used to treat ailments related to the respiratory system. The flowers are therefore used as a remedy for bronchitis, asthma, sore throat and allergies. Traditionally they have also been used as a treatment for catarrh, tonsillitis and ear infections. The elder flowers are classically used for colds, flu, and to reduce high fever, as they contain strong diaphoretic and cooling activity. In 1992 a team of Israeli researchers at Hadassah University Medical Center in Jerusalem created a standardized elderberry extract which contained three flavonoids. Laboratory tests showed that this extract appeared to work on the most common strains of the influenza virus. The extract, which is sold under the name Sambucol®, appears to work by inhibiting the virus’s ability to enter the cells, thus restricting the viral infection and cause an improvement in symptoms of the flu. As a remedy for the common cold and sore throat the elderberry flowers are often combined with yarrow (Achillea millefolium), peppermint (Mentha x piperita pipe) and hyssop (Hyssopus officinalis). The elder flowers are thought to strengthen kidney function and have diuretic effect and are therefore used for kidney stones, rheumatism, arthritis and gout. Many people suffering from rheumatic condition appreciate elderberry because it supposedly reduces pain. This herb is an effective detoxifier and is believed to help clear infections such as acne, boils, conjunctivitis and skin rashes. It is used as an herbal remedy for constipation. Elderberry is also commonly used in Europe as a mild laxative and diuretic, suggesting that elderberries may also benefit kidney health. Anti-aging properties may be in elderberries. Recent research carried out at Tufts University has revealed that elderberry contains four anthocyanins that work to protect endothelial cells, which line artery walls, from oxidative damage caused by free radicals. 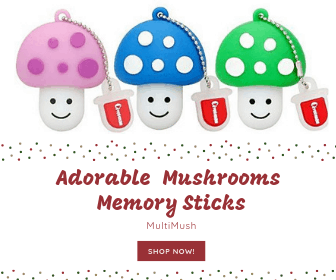 It is used as an herbal remedy to boost the immune system. Black elderberries encourage a healthy immune reaction against undesired organisms that induce flu-like symptoms. 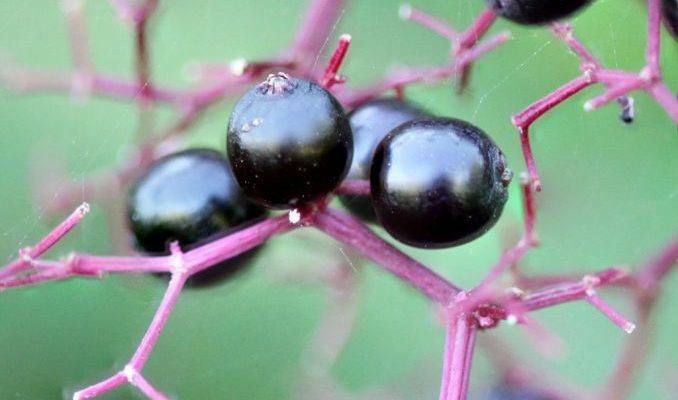 Black elderberries antioxidant and immune-enhancing properties may have a beneficial effect on the body’s normal response to influenza viruses A and B. The berries like most berries from other plants are loaded with antioxidant flavonoids. As liquid extract: The liquid extract should be taken in amounts of 5 ml (for children) to 10 ml (for adults) twice per day, and can be mixed with other juices. As a tea: To make the tea, boil 3-5 grams of the dried flowers in 250 ml (1 cup) boiling water for ten to fifteen minutes. Taken three times a day. Bark and root bark should be used fresh. Use 1 level tsp of the bark or root bark in half a cup of boiling water. Take no more than 1 cup a day, a mouthful at a time. Elderberry usually comes in tinctures, liquid extracts, lozenges, syrups, standardized extract capsules, and throat sprays. As with any medication or herbal supplement, the dosage directions on labels should be followed. The root, bark, and leaves of elderberry contain toxic alkaloids and cyanide glycosides which can cause nausea, vomiting, and diarrhea if ingested in large quantities. These parts of the plant should not be used unless under the guidance of a doctor or other professional healthcare provider. The dried flowers and the ripe berries, when consumed in moderation, are determined to be without risk. Large quantities of the flowers may cause vomiting and diarrhea. The berries when eaten raw can cause nausea and vomiting, which may be due to a small amount of toxic substances in the seeds. The commercial product Sambucol®, according to the manufacturer, should not be used by pregnant women. All the fresh parts of elderberry may cause allergic reactions in some people. Barnes, Joanne; Linda A. Anderson & J. David Phillipson: Herbal Medicines. A guide for healthcare professionals. Second edition. London, Pharmaceutical Press 2002., Elsevier 2005.